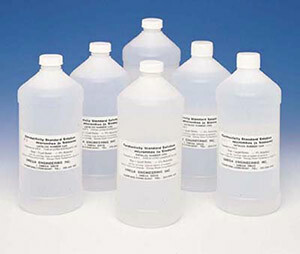 Conductivity standard solutions are used for calibrating a wide range of conductivity instrumentation. To calibrate your instrument, select a conductivity solution which is close to your measuring range and calibrate the instrument for optimal system accuracy. Standard solutions are available in either 45, 50, 1500 or 4500 µmho/cm ranges. The conductivity solutions are recommended to be used within +/- 5% of 25 C. No temperature correlation charts are available for higher or lower temperatures. The conductivity solutions contain Potassium Chloride, a full MSDS sheet can be requested from our Customer Service department. Note: Note: Conformance Certification is available at time of purchase, Add the item "CAL-CDS" to your order. Only 1 certification charge is required per order. Shelf Life is 1 year from date of manufacture except for CDSA-10 which is six months. Please note that due to time in the supply chain and inventory only 50% of shelf life may remain on receipt of this product.